It is now 19 years since the Dalai Lama launched his first offensive against Dorje Shugden practitioners, which began with his sudden and unwarranted proclamation of Dorje Shugden as a perfidious spirit that should be shunned, if not eliminated altogether. That was the reason the Dalai Lama and his refugee government, the Central Tibetan Administration (CTA), gave for banning the religious practice of the deity many believe to be a form of Manjushri, the Buddha of Wisdom. The practice itself is over three centuries old and in forbidding the worship, the Dalai Lama commits a serious breach of human rights provisions that ironically, he and his government are accusing China of. In almost two decades, the Dalai Lama has not managed to present any scriptural or even any commonsense reasons as to why Shugden believers’ rights have been violated. Instead the Dalai Lama has denied that there is even a religious ban and accuse those who oppose his will to be enemies of the Tibetan people, who are on the Communist Chinese Government’s payroll. Left with no choice and after a decade of pleading and lobbying the Dalai Lama for a fair hearing, segments of the International Shugden Community took to the streets to the protest the Dalai Lama, and demand that he ‘Stop Lying’. Given the Dalai Lama’s well cultivated and formidable reputation as a Gandhi-esque champion of peace, love and all good things, or otherwise the Buddha of Compassion, the protests represent a severe puncture to the Dalai Lama’s prestige. However, even as the Dalai Lama and his government fail to justify their violations of Shugden practitioner’s rights, his vehement denials of the religious ban indict him when we consider that both his and the CTA’s official websites are rich repositories of evidence of their deception. For example, the statement by the 100th Ganden Tripa (lineage throne-holder of the Gelugpas) Lobsang Nyima Rinpoche who presided over the lineage as its head from 1995 to 2003, is published on the Dalai Lama’s website to warn the monastic community not to oppose what the Ganden Tripa clearly identifies as the Dalai Lama’s ban on the worship of Dorje Shugden. The Ganden Tripa is the most senior lama (in monastic ranking) of the Gelug Buddhists and therefore this statement published by the Dalai Lama is meant to be an instruction to be obeyed. Looking at the statement of the Ganden Tripa on the Dalai Lama’s official site, there is no mistaking the religious ban. On the 14th of July 1996, about a hundred monks who are devotees of Dorje Shugden conducted a peace procession. About eleven monks from Ganden Jhangtse, Serkong House joined in that movement. This was witnessed by all the monks. It was further decided that this procedure will be followed in the event of all such actions in the future. We also wish to remind that this is not the whim of a few individuals; this is a genuine democratic process. Exhibit 2: The CTA’s Department of Health issuing an order to obey the Dalai Lama’s ban or face the consequences. Which refers to a 1996 order by the Tibetan Government in Exile’s Department of Health to its employees to give up Dorje Shugden’s practice or resign from their jobs. One should also take stringent responsibility to urge relatives who worship Shugden to abandon this worship. At the gathering of the relevant staff members, make this announcement. And make sure that no one comes up with excuses of not having heard it. We also request you to send us the signed resolution at once from each and everyone. And in addition, the directive instructs the general public not to have any dealings with the expelled monks. The Dalai Lama’s purge of Dorje Shugden worshippers continued right through 2008 when the Dalai Lama and CTA were most vociferous in their sanctimonious condemnation of the Chinese government for oppressing Tibetan freedom. At 3:52 the Dalai Lama is heard saying that he started the ban on the Dorje Shugden practice. Some Dalai Lama apologists have argued that the Tibetan word the Dalai Lama used does not mean ‘ban’ in English but there is no arguing that whatever the English equivalent is, the Dalai Lama’s intention is clear – to wipe out the Shugden faith altogether. It is this action that warrants scrutiny, not the semantics. In the same video, what the Dalai Lama is recorded stating at 1:29 and again at 2:32 match the intention of the 100th Ganden Tripa’s statement. There is no mistaking the Dalai Lama’s message to the Tibetan monastic and lay community and his objective. With such clear statements by the Dalai Lama and the presence of existing documents on the Dalai Lama’s official site, it is foolish although not altogether surprising that the CTA should so brazenly deny that there is a ban against the practice of Dorje Shugden. Instead, they insist that the Dalai Lama has merely advised the people not to continue in their worship of the deity but has not infringed on their rights and freedoms. And it is precisely in the CTA and its co-conspirators’ insolent denials and the manner by which they attempt to refute obvious and unassailable facts, that we see their real character. 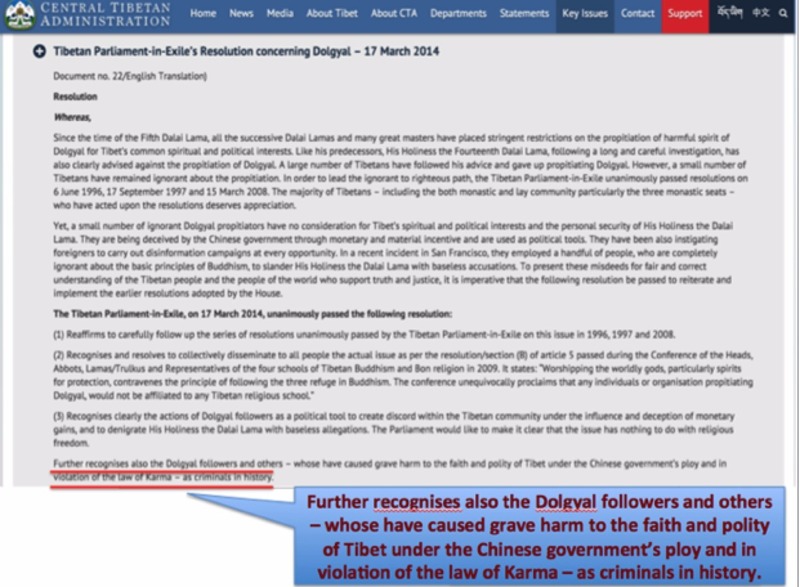 As recent as June 2014, the CTA published a ‘Statement Concerning The Cult of Dolgyal/Shugden’ in which the CTA flagrantly denies there is a religious ban. If that were true, it would mean that both the 100th Ganden Tripa and the Dalai Lama were wrong to have given the impression that there was a ban. And if so, then this CTA’s statement should clarify that neither the Dalai Lama or the Ganden Tripa intend for anyone to enforce the ban / restriction / prohibition / embargo on the Dorje Shugden practice and further, that there should no backlash whatsoever should anyone chose to continue with the practice. Alternatively the statement could recognize that the Dalai Lama had in fact declared a ban which the CTA now officially opposes as a democratic government established to protect the rights of the people. These are simple enough responses if it is true that there is no state-sponsored decree to punish Shugden followers because of their religious practice. One of many official statements by the CTA that deny any wrongdoing in its persecution of Shugden Buddhists. But instead the CTA statement did none of that. It denied flatly that the Dalai Lama is suppressing any religious freedom and insists that there is no ban on the Shugden practice. 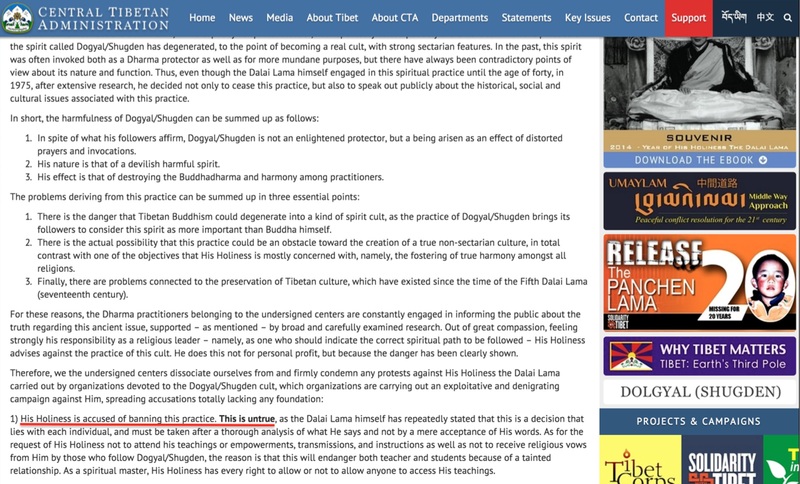 Then the same CTA statement reveals itself to be a tool of an ongoing smear campaign against Shugden practitioners. It is clear from the verbiage that the CTA’s statement is designed to create negative sentiments of Shugden practitioners and to provoke anger and fear amongst the Tibetan people, the means by which the Dalai Lama and CTA enforce compliance of the Dalai Lama’s directive. Not in possession of any law enforcement units or army (in fact it is not recognized as a legitimate government by the governments of the world) the CTA manipulates public sentiments, inflames anger, and directs it against those who oppose them, such as Shugden followers and Tibetans still believing in the push for Tibetan independence from China. It is no coincidence that Tibetans who oppose the Dalai Lama’s ‘Middle Way’ are similarly labeled enemies of the people. The tone and language of the statement leave no doubt of the CTA’s intention which is to create ill will against Shugden people as it has systematically done since the onslaught of the ban in 1996. Three months before the CTA released its June 2014 statement denying a religious ban, it passed an official resolution to criminalize the practice of Dorje Shugden. That itself is a mismatch of its claims on ‘no-ban’ and ‘no-persecution’ of Shugden. How odd for the CTA to have declared that something is a crime and then insist that they have not banned it. It is simply commonsense that when an authority labels an act as a crime, it intends for that act to be forbidden, and in addition, for the public to scorn those who engage in that act. The CTA claims there is no persecution of Shugden worshippers and yet an official parliamentary resolution labels them as criminals. The real crime is in the CTA unconstitutionally banning a peaceful religious practice. The CTA commits another crime by inciting hatred and violence against Shugden people whose practice they wish to eliminate but do not have the legal means to, and so they created a smear campaign that turned the Tibetan public into enforcers. The crime is also in the way the CTA deceived the world public by pretending to be a democracy and to procure financial benefits by that deception. The Tibetan people were asked to focus their attention on a spiritual enemy rather than the corruption and ineptitude of its leaders. The Dalai Lama said in March 1996: Recently I have conducted a number of prayers for the well being of our nation and religion. It has become fairly clear that Dolgyal is a spirit of the dark forces. Therefore, during the Hayagriva invocation last year, I specifically mentioned Dolgyal by name and an incantation was made to ward him off. In the interest of Buddhism and the Tibetan national cause, His Holiness the Dalai Lama has openly advised against the propitiation of Shugden… The Chinese government’s politically-motivated support to a handful of Shugden activists and their disinformation campaigns in Tibet and outside world should be challenged effectively. If all these sound familiar, it is because Adolf Hitler did the same in the 30’s. Hitler blamed the Jewish people for Germany’s economic woes and for losing World War I. Hitler created an enemy out of the Jews just like the Dalai Lama and CTA made an enemy out of Dorje Shugden practitioners. Like the Jews, Dorje Shugden people are banished, marginalized and persecuted when in fact, just like the Jewish people, Dorje Shugden was made a scapegoat for the failures of the Tibetan leadership and used to distract the public from the real problem which is the corruption amongst the Tibetan leaders. Comedic Responses from Robert Thurman et. al. The worship of their chosen deity was not “banned” by the Dalai Lama, since he has no authority to “ban” what Tibetan Buddhists practice. The underlying assumption in Thurman’s argument is that the Dalai Lama would subject himself to a Tibetan authority and act within the boundaries of such authority. However the simple fact is, there is no Tibetan authority that binds the Dalai Lama. Regarded as both the Tibetan people’s god and king, the Dalai Lama is therefore the highest authority and what he decrees becomes ‘law’. Any genuine Tibetan historian would know that and it is disingenuous of Thurman to pretend otherwise. The Dalai Lama is one of the most powerful un-elected and unaccountable theocrats alive in the world today. Interestingly, given the fact that the Dalai Lama has no legal authority to effect a religious ban (as Thurman correctly stated), and yet there exists indisputable evidence that such a ban does exist and is being imposed upon Shugden Buddhists, the logical conclusion is that the Dalai Lama and his government have acted unlawfully on the Shugden issue. Thurman’s false juristic argument also errs in its inference that an act can only be considered a wrongdoing if it is committed outside the scope of defined laws. Up until 1936, it was legal to hunt African Bushmen and there were no laws to forbid that heinous act. But that doesn’t make it right. Similarly, the Aborigines of Australia were not regarded as human beings nor citizens of the nation until 1967; therefore killing an Aborigine was not regarded as a crime until the law was amended to recognize them as people. Again, absence of a law that prohibits a despicable act does not make the act right. The same can be said with the American treatment of the native Indians and black people. Thurman would have you believe that there was no discrimination against the colored people of America because there were no laws against discrimination. If this is the extent of the defense of the Dalai Lama’s actions by an expert of Tibetan Buddhism, then we know something is amiss. The Dalai Lama promoting a Thurman book that ironically advocates loving the enemy. Then there is the embarrassing attempt at defending the Dalai Lama’s infringement of Shugden Buddhists’ rights carried by Tenzin Peljor, a supposedly ordained monk with an inordinate amount of time invested in denouncing Shugden and spreading disinformation about the religion and its practitioners. In an October 2014 post, Tenzin Peljor published an article on his blog that argues in essence, that there cannot be a ban on the practice of Dorje Shugden because there is no “Tibetan word than means ‘ban’ as understood by native English speakers”. The article then proceeds to give a lecture on the definition of the word ‘ban’. There is no Tibetan word for ‘imbecile’ either but there is no short of evidence of imbecilic words and actions gushing out of the CTA. By Any Name, The Persecution and Oppression is Undeniable. The stark reality is, Shugden Buddhists are being interdicted and marginalized purely because of one part of their spiritual practice which the Dalai Lama has unilaterally declared to be offensive. The 100th Ganden Tripa’s statement reflected the Dalai Lama’s will correctly and there was no error. Moreover, for it to have been published on the Dalai Lama’s official website, his office would have vetted the content and concurred with it. There is no question that there is a religious ban unlawfully placed on the practice of Dorje Shugden and even today, Shugden people are singled out, stigmatized and systematically persecuted as a result of the ban. That the offender is a Nobel Laureate may be an embarrassment and inconvenience but cannot in any way forgive his victimization of innocent people. The facts and evidence are indisputable that there is ongoing victimization of Shugden people and an institutionalized and systemic campaign of abuse using ordinary Tibetans and Dalai Lama loyalists. And so far attempts at defending the Dalai Lama have been phantasmagorical, desperate and deceptive. It begs the question, why defend in such an illogical and incongruous manner if there is authentic justification to ban the religious practice? Indeed the Dalai Lama or CTA need only provide clear proof that (i) Dorje Shugden’s practice is the reason why the Tibetans have yet to regain their independence and (ii) that Shugden worshippers act as agents for the ‘enemy-Chinese’ to stumble Tibetan unity and independence efforts, and the matter would have been closed. The CTA hides the ban and its persecution of Shugden Buddhists because it is conscious of the Dalai Lama culpability and its role in infringing upon the human rights of Shugden practitioners. It hides because it is uncomfortably aware that what the Tibetan leaders are doing to Shugden Buddhists makes them every bit the oppressor of freedom they accuse China of. So they continue in their charade and therefore when protestors wave placards at the Dalai Lama that say, ‘Stop Lying’, there are sound reasons for them to do so and it is only a matter of time before this becomes undeniable. It is clear there is an illegal, undemocratic ban against the followers of Dorje Shugden by the Tibetan Govt and Dalai Lama. The evidence is overwhelming to say the least. Why is the Dalai Lama doing this. Dorje Shugden is a ghost or Buddha is not the point, but stop speaking out against the religious faith of another person. Give them religious freedom. By you speaking out against Dorje Shugden does not take your freedom away but you take the freedom of the other person away. Perhaps a new placard needs to be created ‘CTA Stop Lying’. Dorje Shudgen is an enlightened Buddha, he is not Tibetan it arose from Tibet that is a given, and furthermore Dorje Shugden if it is really harms Buddhism, then Dorje Shugden and practitioners will push all Buddhism out of india and not work with the Chinese. That would be more effective way of harming buddhism, to uproot the homes of the Tibetan Buddhism would strike at the heart of Vajrayana Buddhism. China denied the Tibetans a homeland, but China can;t stop Tibetan people from going out to the world. With all due respect, it is very clear that the Dalai Lama and the Tibetan government is discriminating against Dorje Shugden practitioners. It is repeatedly written in their websites and tabled in parliament. If you are a DS practitioner you cannot work for the government. If you are a DS practitioner you are not allowed to attend the Dalai Lama’s teachings. If you continue to practice DS you are going against the Dalai Lama and that will result in the inability to receive independence or autonomy from the China government etc etc. It is pretty obvious that no one can DENY THAT THERE IS NO BAN OR DISCRIMINATION. SUCH ACTIONS OR SPEECHES MADE BY THE DALAI LAMA AND THE CTA DOES NOT CONSTITUTE “AN ADVICE” !! So, where did the Dalai Lama get that idea from? Dolgyal himself said that he was a “Damsi of a Ganden practitioner” when he approached Dagchen Sonam Rinchen. Trijang Rinpoche repeats this story in his book that you host on this website. That book itself contains more than enough information on why the Dalai Lama should oppose Dolgyal. It explains, giving a number of examples, that Dolgyal kills people that are seen as enemies by the narrow sectarian faction of the Gelugpa school. These enemies include oracles for other protectors, Chinese politicians, Bonpo priests and mostly Gelugpas that take teachings from other Buddhist schools. As the Dalai Lama fits into this last category, his opposition to it would strike most people as totally obvious. The lie here is about the fact that there is no ban and all the proofs indicate that in actuality there is a ban. Hence, the protestors held up signs that say ” Dalai Lama Stop Lying”. The article and videos clearly proofs that the Dalai Lama is lying. I am wondering why in the fact of overwhelming evidence, the Dalai Lama keeps up the lie? All his actions with the exception of the ban shows us his is a pure monk with Boddhicitta motivations and a great compassionate human being. So why this ban and why lie about it? That to me is the teaching. But what is this teaching? No doubt that His Holiness has manifested a lot of conflicts and contradiction, and yes the Dorje Shugden ban has created a lot of sufferings. But I believe that His Holiness is an emanation of Avalokiteshvara, and I believe that all these manifestations are to benefit the bigger picture which most of us clearly do not see. I hope that the ban will be lifted very swiftly so that everyone can live together in peace. What compassion? What equality? Dalai Lama even said we should have dialogue with cold-blooded ISIS. But what about Dorje Shugden practitioners? Why is it that it is ok to be nice to outsiders, but to Dalai Lama’s own sect Gelug, harsh oppression and ostracism were carried out towards practitioners who do not agree with him? Then isn’t the love, compassion and equality messages just a lie? It is obvious to everyone that there is a ban on the Dorje Shugden practice. There is a ban because families are being separated, disciples are not allowed to see their teachers, government servants are sacked from their jobs, students are not allowed to go to school, patients are denied treatment at the hospital, Dorje Shugden practitioners are not allowed to travel etc. All these are the viral effects of the ban. When a ban is imposed unlawfully, unfairness and illogical treatments are seen to cause harm in the innocent. These people become the object to receive the negativities that they did not create in the first place. They receive ill treatment just because they are born as Tibetans and being governed by a group of selfish and unprofessional Tibetans in exile. There is no hope for Tibetans in exile for they are being ruled by a feudal system which should be abolished long ago by setting up democratic systems with the millions of dollars received. Since the system is not set up, Tibetans in exile continue to suffer, nothing has been achieved significantly in the past 60 years, we can safely say that the Tibetan leadership in exile are lying about the financial aids they have received, how the sum is being used on top of lying about Dorje Shugden’s practice and its benefits. Who would buy their lies and pretend everything is alright now? Specifically on the Shugden case, the ban that was openly confirmed by the Dalai Lama, the damage is huge and the impact is enlarging by the day. Because of the endorsement by Dalai Lama and CTA, who instigated hatred reaction from the public against the Shugdenpa and families (read here for a true story how a family was left broken because of this ban : http://www.dorjeshugden.com/all-articles/the-controversy/testimony-of-a-victim-of-the-shugden-persecutions/comment-page-1/#comment-205196), the world now witness the true color of the last few Buddhism practicing society, in horror. Even though the ban was baseless, but as we can read from history book, usually malevolent leaders, like Adolf Hitler, deployed such tactic to put the blame of failure onto a particular group of people, no matter how silly or absurd it may seemed. Anti-Shugden campaign felt this way (see here for a how CTA use donations to serve this purpose rather than improve the welfare of Tibetans : http://www.dorjeshugden.com/all-articles/features/cta-pays-for-anti-shugden-websites/). Thurmans face gives me the willies. When I look at him, I am reminded of how far someone can fall and how much of their dignity their willing to give up for the sake of looking good. Theres absolutely no credibility in him once you know his background. Did you lot know that Thurman begged and grovelled on the floor to receive Shugden sogtae? How about the time he took a photo with a prominent Shugden protestor without even realising who the monk is? Now here he is putting out like hes some sort of expert on Dorje Shugden practice and travels here and there to spout more lies and why? To align himself to the Dalai Lama so he can sell more books and get more funding for his “research”. Pfft. The man is a spineless coward who will bend any which way the wind blows and any which way fills up his begging bowl a little more. Its a wonder anyone listens to his drivel. Sure talks a good game but guess what? No matter what you say or what you do, simply being best mates with the Dalai Lama isnt going to save you from the three lower realms. See you there Bob! Camilia has assessed the situation quite well, actually. The reason for the ban is immaterial. The CTA just need a scapegoat and keep barking at it and the masses will follow suit. There are so much evidences that there is a bias and that it is wrong will not these zealots of the Dalai Lama and CTA refraining from imposing a ban. I’m just scared of the negative karma created here that in the end, will create such negative group karma that it will be self-feeding and spiral downwards for all. Can’t help thinking about what I heard somewhere that “Buddhism will be destroyed from within”. Sad, really. Though the Buddha taught love, peace, harmony, gratitude and the middle way, I don’t see that happening here.